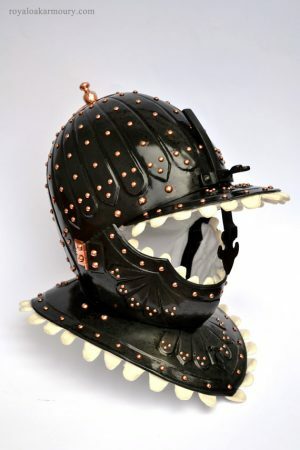 Burgonet, modelled in most regards on a French cuirassier helmet c.1610-1620, once on display with parts of a three-quarter armour in the Higgins Armory Museum, Worchester, Mass. The cheek plates of our burgonet meet at the chin, and lock with a hook and pin on the gorget plate, forming a bevor. An adjustable nasal bar slides through the peak at the brow. 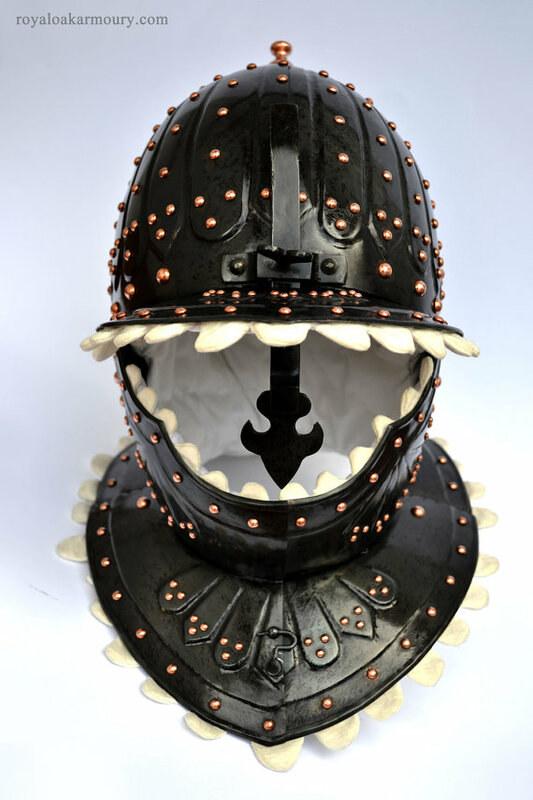 The skull, and all attached plates are re-enforced and decorated with a radiating repousee pattern, accentuated with rows of copper rivets, which contrast the blackened steel surface. The fluted decoration of the helmet’s skull terminates at the apex with a copper finial. The interior is entirely lined and remarkably comfortable. 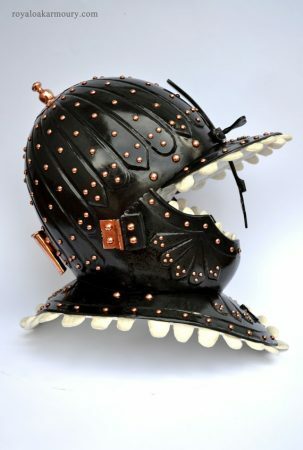 Our version has been made 16 and 18 gauge steel. As in the original, the skull has been made from two halves, riveted together. 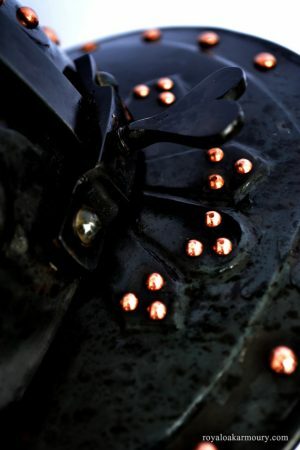 All rivets except for those used to secure the nasal assembly are of copper, and there are over 300 of them. 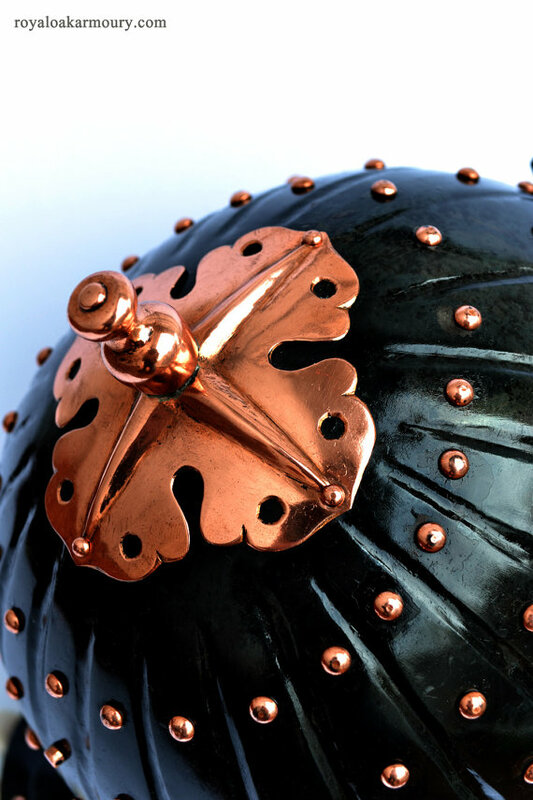 One special, pierced rivet and a copper plume holder can be used to hold and secure a large plume, which can be included at extra cost. The steel surface of the helmet has been blackened by heating, then quenching in oil.